Two local organisations have teamed up to buy a piece of equipment that could one day save the life of a Keynsham resident. 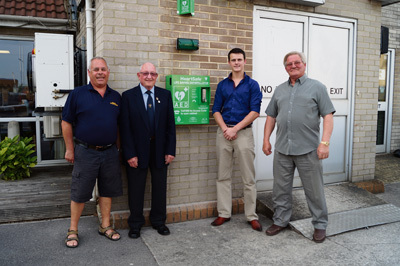 The town’s Royal British Legion branch and the Cornucopia Masonic Lodge have clubbed together to purchase a state-of-the-art defibrillator after raising funds among members and hosting events in aid of the cause. The machine, which delivers an electric shock to the heart in the event of cardiac arrest, has been installed on the outer wall of the Royal British Legion Club in Charlton Road. Daniel Cannon, Master of the Cornucopia Masonic Lodge, said the location was vital as it meant the public would have 24-hour access to the machine in case of emergency. Members of the Keynsham British Legion Branch have delivered leaflets to homes and businesses in the area to let residents and workers know the defibrillator is there should it be needed. The first few minutes following cardiac arrest are critical, with figures from the British Heart Foundation showing there are 60,000 out-of-hospital cardiac arrests every year in the UK. Access to the defibrillator is gained by a code given by a 999 operator. The machine then guides the user through each step and can be used on both children and adults.